Artist of the Masterclass -Akanksha Sharma, a professional crafter. Join her workshop to enjoy wonderful practical learning to make your own adorable mini succulent planters!! 1. How to make cute succulent planters with air dry Thai clay to boost your decor plan. 2. Tricks and tips of clay sculpting. 3. How to work with air dry clay opens up immense possibilities of making a variety of projects like name plates, key chains, photo frames, show pieces and much more. 4. Working with Thai clay, glass bottles, acrylic paints, oil paints, chalk paints, soft pastels, clay sculpting and modelling tools, and Little Birdie’s flower embellishments. 1. 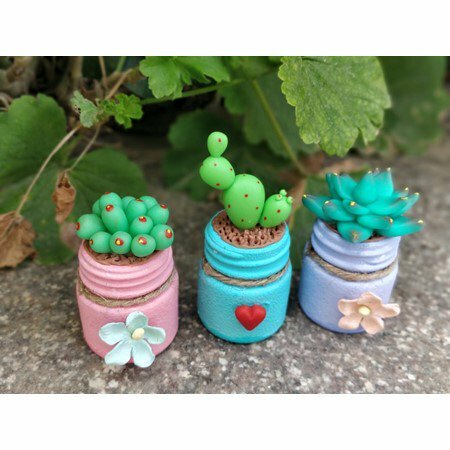 3 cute handmade clay succulent planters.